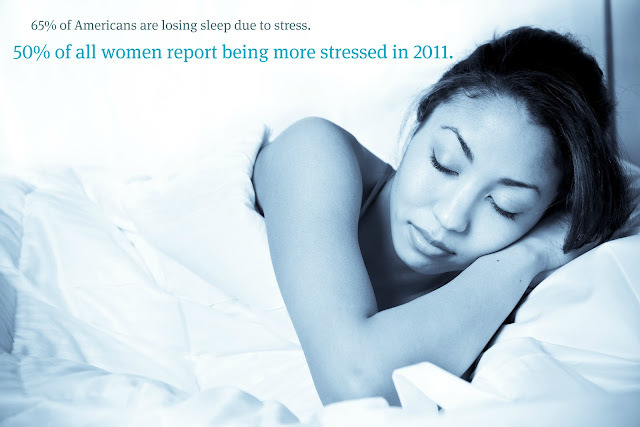 The Skinny - HEALTHeME's Official Blog: Shocking facts about your stress! I recently read an article detailing a recent study about stress and it’s effects, noting that even mild levels of stress may lead to disability. Researchers also found that a quarter of the medical reasons for receiving disability benefits, from blood pressure to stroke, could be linked to stress. But, perhaps most significantly, the authors question whether the demands of modern society are just simply too much for our bodies to handle? I will go out on a limb and answer their question with a “yes” and a “no”. There is no doubt that chronic stress carries with it some serious health implications, and many of us are definitely stressed out. A new “Stress in America” survey reports 1 in 5 Americans is under “extreme” stress. Add to this the estimates that 75% to 90% of doctor’s visits are related to stress, and I think it’s pretty clear that we aren’t managing our stressed-out lives so well. But, the “no” part of my answer has to do with the fact that I think we can do better! I don’t believe that today’s world is too much for us to handle – that simply doesn’t give us enough credit. I think we need to make our well-being more of a priority and get our stress in check. So, how are we to manage the seemingly inescapable stress in our lives? Here are 6 proven strategies to help you stress less! Sleep well. Here’s a “chicken-or-the-egg” question for you: Are you not sleeping well because you’re stressed or are you more stressed out because you’re not sleeping? No matter the reason, the fact is that sleep is one of our best friends when it comes to flying below the stress radar. Try setting a bedtime and sticking to it. Plus, turn off all technology (yup, you read that right, ALL technology) an hour before your bedtime. Decreasing the stimulation from the Internet, Facebook, and TV will help you bring it down a notch and settle into a more peaceful sleep. Try this for one week and you will be amazed at how rested you feel! Exercise. Whether it’s the endorphins that are released during a workout or simply giving you some time outdoors in nature, there is no doubt that exercise is an effective stress buster! When you’re feeling a little frazzled, take an exercise break: go for a 10-minute walk; do some squats, push-ups, and crunches; or schedule an exercise session with a friend. Get your omega-3’s. One study has found a diet rich in fish oils (omega-3 fatty acids) can decrease reported levels of anxiety as well as the reduce the chemicals that circulate through the body in response to stress. Good sources of omega-3 fatty acids include fish, walnuts, soybeans, and tofu. Calm your mind. A recent study found that a regular meditation practice could actually change the structure of your brain. Following an 8-week meditation practice, researchers saw improvement the areas of the brain that are associated with empathy, self-awareness, and compassion, while noting a decrease in the areas associated with stress and anxiety. If you’re a meditation-newbie, try setting aside just 2-5 minutes per day to begin your meditation practice. Practice yoga. A regular yoga practice is often associated with improved flexibility, healthier pregnancies, and improved quality of life for back pain sufferers. Yogis (also known as people who practice yoga regularly) report lower levels of anxiety, tension, hostility, and fatigue, according to a 2011 study. Another recent study found that yoga might be more effective than other forms of exercise when it comes to boosting your mood and decreasing your anxiety. It’s time to step out of your stressed-out life and step onto your yoga mat. Think positively. You’ve probably heard it said that you can’t control events but you can control your reaction to them. And, I know what you’re thinking: “Yeah, you try dealing with a tough boss, shuttling your family around, cooking dinner, and have a day that runs from 6am to 11pm and then tell me that it’s my perception that makes me feel stressed to the max.” I get it. Life can be challenging but altering your perception (even a little) can greatly change your well-being. Negative perceptions can keep your mood low and your stress high. Supporting this notion is a 2011 study in which training teenagers in positive thinking was found to improve their mood and reduce anxiety. Although you can’t control every little thing life throws your way, you can control how you view these challenges and how you react to them. Use positive affirmations and put a positive spin on yourself and situations you encounter.